This is the third in a series of posts about Le Grande Experiment (which translates into no language except the one we’ve made up), a somewhat recent adventure wherein we sent teams to Denver and Italy on a vital mission: to hunt down and test the best equipment for scaling up our process. Our current setup works well for our factory space on Valencia Street, but as we grow into our new factory space on Alabama Street, we believe there are better options out there for improving the quality of our chocolate and expanding our capacity to experiment. While we could do the work on the phone, we find the best results come from hitting the road and getting our hands dirty. The exciting conclusion to our experiment is here! If you haven’t read about Le Grande Experiment, it is worth reading up on Part 1 and Part 2 before reading on as I’ll be making reference to some of groundwork laid in those posts. We now rejoin our intrepid research team in San Francisco. Why we care about flavor and texture should be relatively obvious. 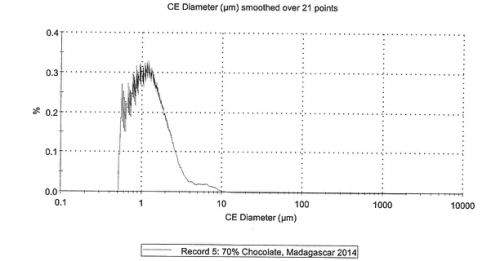 As we only make two-ingredient chocolate, viscosity is a constant challenge. Without added lecithin or fat (cocoa butter), we can’t control the viscosity to make the chocolate more workable the way many other makers can, so we need to set ourselves up for success! Our overall goal is to make more chocolate with less labor, and to make chocolate which tastes better, has a better mouthfeel, and is easier for us to handle. How hard could it be? Because flavor is our major driver, the first order of business was to understand the impact of the equipment on flavor. Typically, we use blind taste tests to determine these things, but doing a blind taste test of our standard chocolate against chocolate we made with alternate equipment made me nervous. Even though the beans were all roasted the same way, there were a number of variables that were difficult to control and I worried we wouldn’t be able to make a fair comparison. It turns out I sometimes (*cough* often) overthink things, and luckily fate stepped in. It was January, and we had made it back to San Francisco in time for the semi-annual FCIA meeting (which always takes place in San Francisco in January), which gave us a phenomenal but transient opportunity to talk to a number of other chocolate makers about our results as well as get some chocolate folks tasting chocolate! So, we threw caution to the wind and did a blind tasting of the three methods. Since we used the same beans for each test, we felt confident that the fat content and type(s) was pretty similar between the samples. This meant that any differences in texture and viscosity are likely due to moisture, particle shape, or particle size distribution. 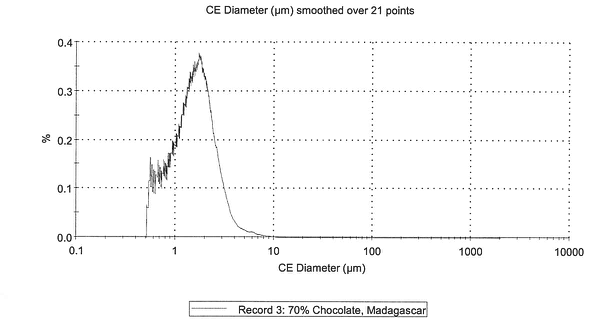 Before diving in further, it’s probably worth outlining why these factors can influence what I’ll call “texturosity.” As Cynthia noted in her post on Le Grande Experiment 2, chocolate is technically a solid in liquid colloid (a.k.a. a “sol”). In our case, the liquid is the fat released from the beans during the refining process, and the solids are what’s left of the cocoa once the fat is released (including the sugar we add). 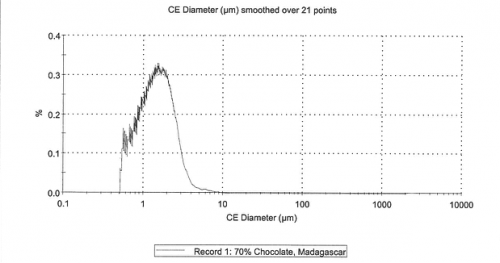 The ratio of particles to fat will influence both the texture of the chocolate as well as the viscosity. In terms of moisture content, adding moisture—a dissimilar liquid—to a combination of fat and particles will break the homogenous mixture and the sol will start to thicken. This makes it harder for us to work with, and so we try to keep moisture to a minimum. As for how particle shape influences viscosity, imagine a vat full of identical balls, all of which can move over each other easily. Then imagine a vat full of irregular spiked balls. Irregular particle sizes make the chocolate more viscous because, like the spiked balls, they cannot move amongst and around each other easily. 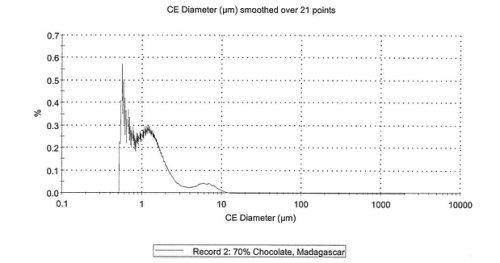 Less viscous chocolate is much easier to work with, so we want to optimize for machines that will make the most particles the same, rounded shaped. The last factor we’re considering is something called “particle size distribution,” by which we mean the quantity of each sized particle in a given sample. To illustrate this, imagine a vat full of identical balls; they move easily! Then imagine a vat of balls of various sizes, wherein the smaller ones can fit in the spaces between the larger ones, creating a relatively static, solid vat. 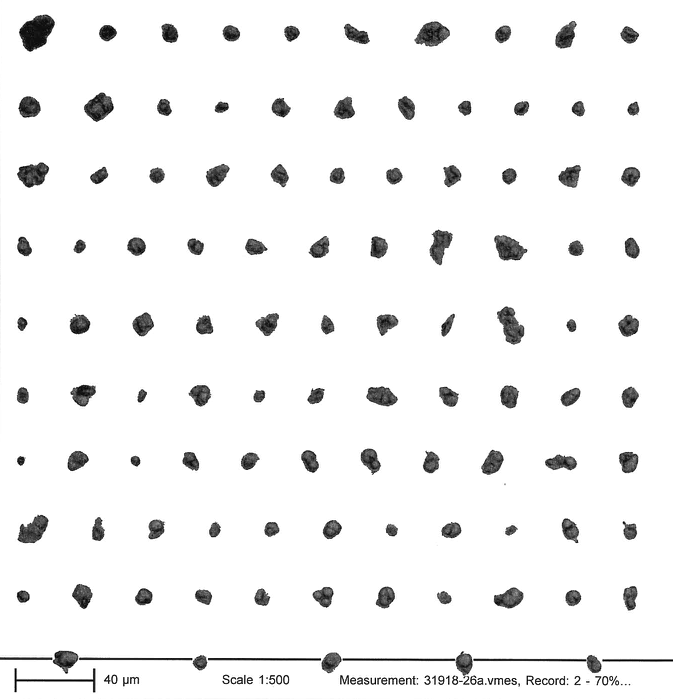 To reduce viscosity, our goal is to have all of the particles as similarly sized as possible. While the machines we use can’t really impact fat content or type in the beans, they can impact moisture content, particle shape, and size distribution. 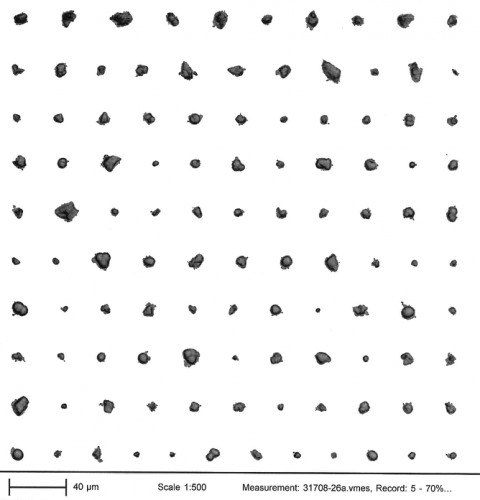 Once we had samples from our current process as well as samples from a ball mill, from a ball mill / rotary conche, from a roll mill, and from a roll mill / longitudinal conche, we looked at each of them under a microscope and found the results are below. 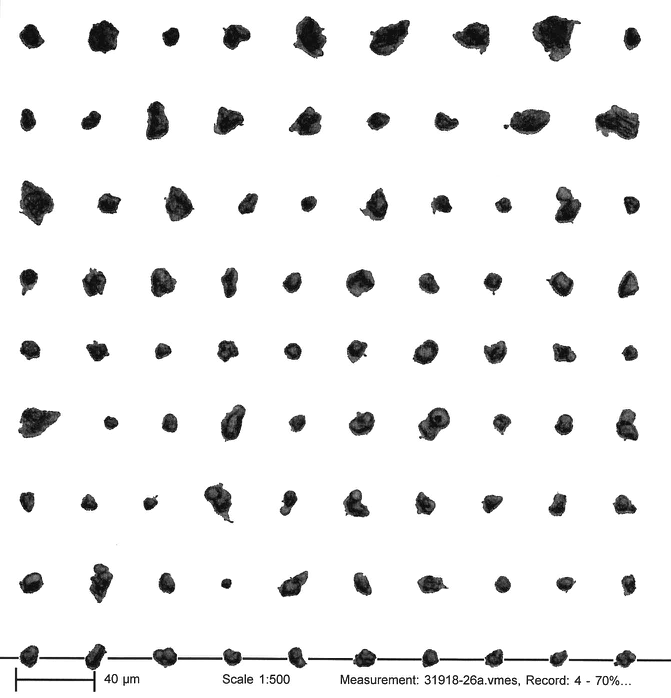 Roll Mill: narrower distribution of particles but two distinct sets, one smaller, one larger. Roll Mill / Longitudinal Conche – after conching, the particle distribution is significantly narrower! 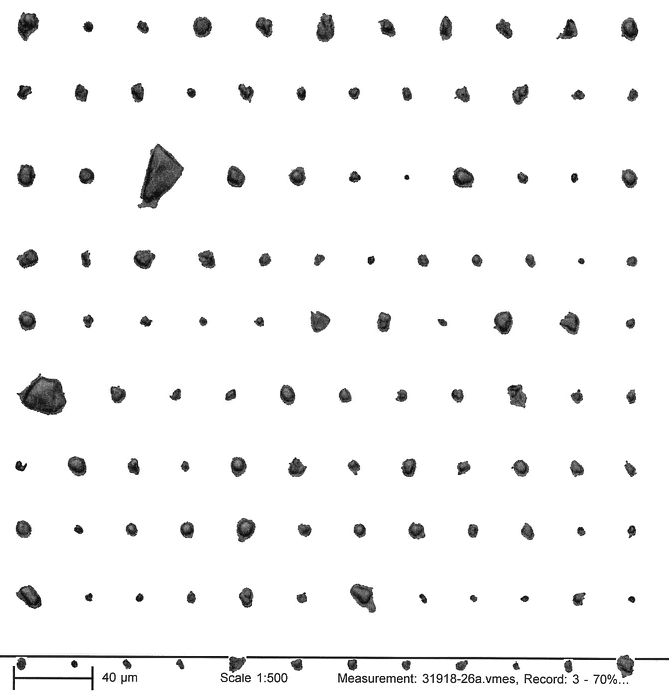 The main thing you’ll notice is that there are two clusters of particle size in the post-refining but pre-conching phase. 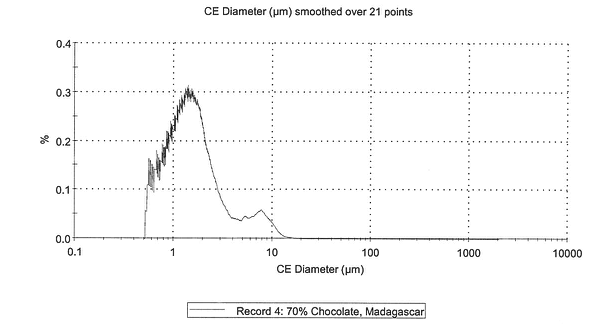 As it turns out, conching the chocolate resulted in a tighter particle distribution. The conche also reduced particle size overall through the shearing and rounding action of the conche. 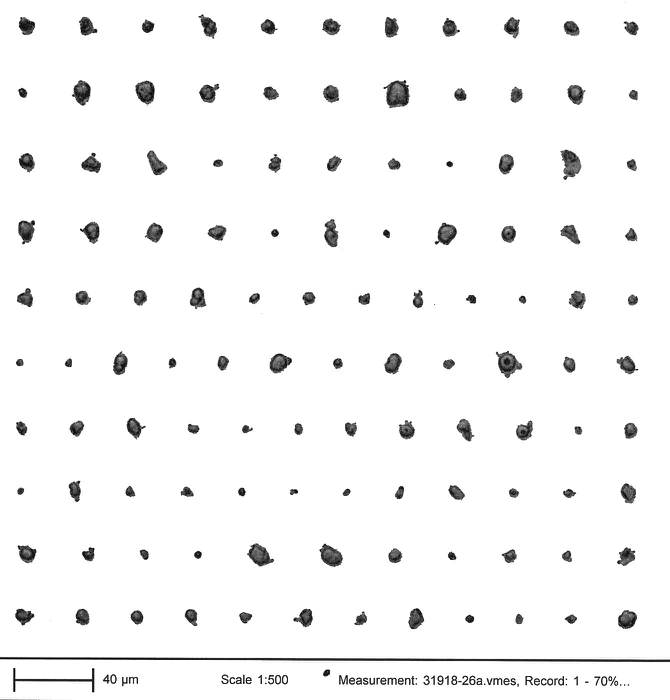 The sample from the Cocoatown (that we use in the factory now) didn’t have the double cluster and had a wider particle size distribution. We LOVED the Packint 2 roll pre-refiner. It produced a shelf stable pre-refined material without adding much heat. This means we can control flavor more effectively. Use a five roll mill for refining all the other beans. Unfortunately it is almost impossible to purchase a small five roll mill, so we bought a used Carle & Montanari 980MM mill from Base Coop. Use a longitudinal conche for other products. Sadly longitudinal conches are not easy to come by but it was Steve DeVries to the rescue. We purchased a used longitudinal conche from Steve, and our Magic Man of Machines, Snooky, is working on reconditioning it now. Okay! We now have beans, we have equipment to roast, crack, winnow, refine, and conch. Next stop… TEMPERING!